REMEMBERING IGOR. A TRIBUTE TO A LEGEND. This has been a very hard week for most of us, and people and friends from around the country. The global nordic skiing community and especially here at CXC, have suffered a loss that is rather impossible to process; our coach, our mentor,our ally, our friend Igor Badamshin passed away suddenly last week at only 47 years old. Each one of us is deeply saddened in our own way. It is really impossible to try and make sense of it, because it makes no sense. What we all know is that in his 47-year life span, he lead an extraordinary life, from his own racing career to the countless acts of caring, hard work, enthusiasm and most of all his time, to help make the sport grow, but also how to have fun doing it. His love of people and the sport knew no bounds. I first met him when he arrived to coach at Gunstock in New Hampshire, and he was loved there. Young people were immediately drawn to him, and already the countless internet tributes to Igor from his athletes and friends has given just a small glimpse of what he had achieved, and the grace and style that he achieved it in. He was a person of amazing energy and I never failed to be amazed by the power of his hard work, who could build anything, or simply move mountains. Igor started with CXC as a high performance advisor in 2007, and then started to coach with CXC Junior Development Program in 2008, was CXC Team Coach in 2012-2013 and until last Friday was leading the program as a CXC Head Coach. “I have known Igor for many years and he is always ready to help, to share joy and sorrow. He is a very good man and a good friend. I speak in the present tense because I still can not believe that he is no longer with us. It is a huge loss for me personally and great sorrow for his entire family. Anytime he struggled with difficulties and setbacks, he would always smile and was not discouraged. So I knew him and try not to forget.” said Andrey Kirilov, a teammate from the Bronze Medal relay at the World Championships in Falun, Sweden back in 1993. A memorial/gathering is scheduled for Saturday, February 8th from 8pm-10pm at the Cable Community Center, Cable, WI. “Igor was the best friend, colleague, mentor and just an amazing person. He was an integral part of everything we did at CXC. He was the one I would call first for an advise or opinion. It’s hard to imagine that he is not with us any more. Just before the tragic moment he called and we talked about plans for the next year, dates for the camps, programs for middle school and high schools skiers, and many other things. To remember Igor, and his passion to coaching junior skiers and athletic excellence we would like to establish a fund in his name to provide scholarship programs for assisting talented junior athletes in Central Region to compete at the U18 Championships and Junior World Ski Championships, ” reflected his long time friend, CXC Executive Director Yuriy Gusev. The many things that made Igor so special are irreplaceable, but his love and enthusiasm for skiing and people will continue to reverberate and live on in all who he touched. That is but one of his lasting legacies. 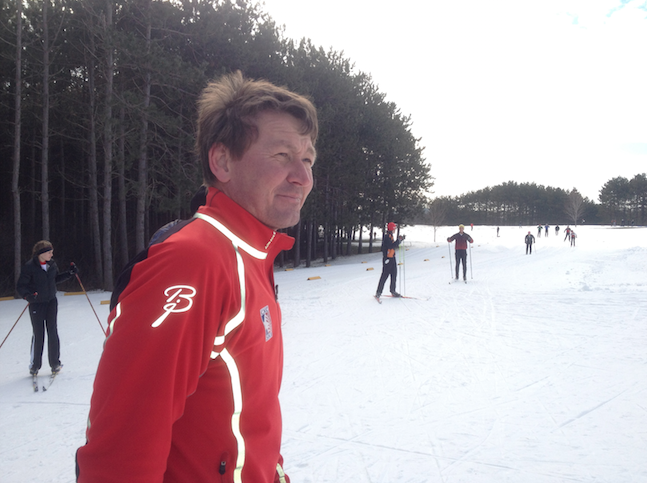 Donations towards Igor Badamshin Fund can be mailed to CXC Skiing, P.O. Box 930442, Verona, WI 53593 with “IB Fund” on the memo line. In all of our collective grief, the fact we must remember was that Igor lived, boy did he live…and we are all the richer for it. I was sitting down with Harri Kirvesniemi in ISPO when word came of Igors passing. News was stunning. Harri knew Igor from their racing days.Harri has great admiration of Igor as a racer and fellow human being. Also many saunas I took with Igor stories we told. His passing has left emptiness in my/our hearts and our ski community.